Looking for ways to increase your website traffic with social media? Then you’ve come to the right place. In this article, we’ll be teaching you tips and tricks that you can adapt to get more website traffic. Social media is extremely powerful when it comes to generating traffic. In fact, a report by Shareaholic found thatsocial media is now the #1 driver of all website referral traffic. As of December 2014, 31.24% of all referral traffic was from social media; compare this to the 22.71% from the same period in the previous year. That’s a tremendous increase of referral traffic in a very short period of time, and who knows what will happen in the near future? The conclusion we can draw from this is simple. If you aren’t taking advantage of the power social media has, you’re missing out. This is probably the most important thing if you´re looking to increase your website traffic. Simply because this is what will drive the most traffic, while it is the most easy thing to do. 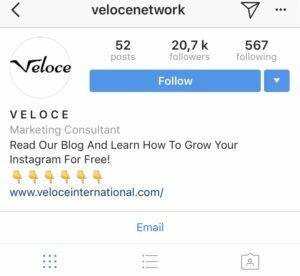 With a simple link in your social media bio you can increase the amount of traffic to your website quite a lot, depending on how big your followings are of course. Adding a link in your bio is a also very good way to create an interest among people. Because before they’ve pressed it, they don’t know what will appear. And often, people are too curious not to press it. Also, adding a link in your bio lets you show that your page is the real deal. 2. Link to your website in (some of) your captions. Writing an interesting caption can engage your followers to visit your website BUT it is important that you aren’t too spammy and write your website link in the caption every single time you post something. One example is to write a small teaser in the caption and then write “Read the full story on my website veloceinternational.com” or something similar. That way you aren’t too spammy , while at the same time tempting people to visit your website and read more. Here is a tweet from Forbes. Can you spot the link? Another thing to have in mind is that you can’t share clickable links on Instagram on other places than in your bio. That’s why, sometimes, you can choose to write “Link in bio” instead, because people will otherwise be forced to read the link you’ve written and then try to search for it in Google. And that’s a lot of trouble and effort. This has actually shown to be very effective. However. You can’t expect people to just put your link in their bio just by asking them – most people will say not. However, it isn’t impossible. For example, if you ask people who have a similar amount of followers as you, you can offer to put their link in your bio in exchange. That way, completely new people will be able to find your website and you’ll possibly also widen your audience. If you didn’t know, you can actually do this, and it’s a pretty big thing already! Larger pages with everything from 100K to several million followers can (in exchange for money) put your link in their bio for a limited time. Just imagine how many more clicks you will get if your website link is placed in the bio of an account with 4M+ followers. Email us if you would be interested in learning more about how you can do this: hello@veloceinternational.com. This method is not free, but doing it correctly can generate some tremendous results. 4. Hold giveaways that you enter through your website. Giveaways are ALWAYS a good idea to attract an audience – because who doesn’t like free stuff? Announce your giveaway on all your social media platformd and let people know that that they enter the giveaway by visiting your website (and signing up). The better prizes you have, the more contestants you will have, of course. This was everything for this article! We hope you have learned how you can increase the traffic to your website with the tips above. If you have any other questions regarding How to get FREE website traffic from social media, don’t hesitate to comment below. PrevWhich Social Media Platform Should You Choose? NextHow Are Big Brands Using Snapchat?